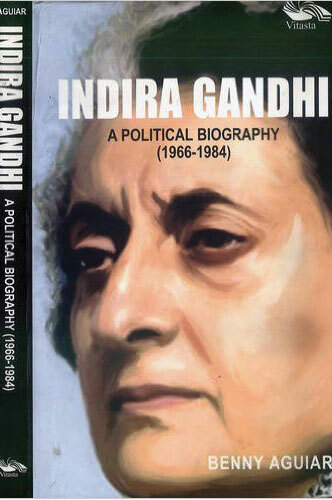 Twenty years after her death, a study on Indira Gandhi still exercises an interest. A chronicle of the years between 1966 and 1984 during which, except for two or three years, Indira Gandhi was India's Prime Minister. The book is a historical study of the tumultuous events in which Indira Gandhi played a dominant role. The author has tried to piece together these momentous events into an integral narrative so that it reads like a story. Father Benny Aguiar delves into his memory to write about the period when Indira Gandhi dominated the Indian politics. Indira became the Prime Minister of India in 1966 and remained so, barring the period 1977-79, till her assassination in 1984. She had a colossal presence and the history of India of this period got closely interwoven with her story. It is in this sense that the book is important. It is not a historical record of events, which many other books have already done. Father Aguiar recounts from his experiences of the period to produce an emotional history that helps understand the situation as it existed then. It is a close brush with reality and tries to make an assessment about the various feelings that shaped Indira’s decision-making. He does not justify the Emergency but tries to understand why Indira Gandhi, who was a democrat, imposed a system that she was going to denounce when she came to power again in 1980. She spoke about the country needing a healing touch. Not in a thousand years, she said, would the need arise for another Emergency. Indira Gandhi was an enigma for most of her colleagues. She was politically smarter and could see through the events. This is why she upstaged most of them during her struggle for political survival. In doing so, she kept losing friends one after the other. Gradually her son Sanjay Gandhi was the only one she could rely on. The mother and son duo used to coordinate their activities for running the affairs of the country. But fate snatched away Sanjay from her and left her crestfallen. She gathered the loose strings and began the task of governance. Indira Gandhi took tough and controversial decisions during her premiership. It is natural for people to dissect them post facto. A real understanding, however, will emerge only if the situation of that time is simulated. Father Aguiar tries to do that. This is probably for the fist time that a book tries to highlight the role played by various Christian organisations during the numerous crises facing the nation during this period—whether it was the Emergency, riots, relief or rehabilitation. The book also talks of the meeting between Vatican Chief Pope John Paul II and Indira Gandhi. Besides studies in philosophy and theology, Benny Aguiar graduated in Economics from St. Xavier’s College, Bombay (now Mumbai) and in Education from St. Xavier’s Institute of Education, Bombay. After a short stint of teaching English and History, he was appointed Assistant Editor and later, in 1961, as Editor of the 154-year-old Catholic weekly, The Examiner of Bombay. From 1967 to 2000, he was Indian correspondent for the international Catholic weekly, The Tablet of London. In 1994, he served as the Editor of the Indian Currents, Delhi. In 1965, he covered the three months long, epoch-making last session of the Catholic Church’s Second Vatican Council, and later, three synods of Bishop in Rome for The Examiner, in 1991, he wrote a chapter “The Impact of the Council of India and Sri Lanka” for Modern Catholicism, edited by Adrian Hastings and published by Oxford University Press. He also wrote for The Month (England), The National Catholic Register (USA), 30 Giorni (Rome) and The Times of India, Bombay. He was the President of the Indian Catholic Press Association and the South Asia Catholic Press Association.